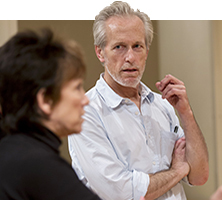 The longstanding collaboration between Artistic Director Barbara Gaines and the incredibly versatile Chicago actor Larry Yando dates back to the early 1990s when Chicago Shakespeare was based at the Ruth Page Theater. Their most recent project together, King Lear, has garnered great acclaim from audiences and critics alike. The Wall Street Journal says Yando’s performance in the title role “will fill you with awe… noteworthy not just for its unflagging intensity but also for its textured complexity.” Recently, the two sat down to discuss his relationship to Shakespeare’s work, both on stage and off. 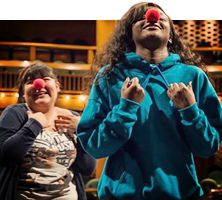 This year marks the ninth annual production of CPS Shakespeare!, a model initiative recognized by the White House in 2014. Students and teachers work side-by-side to engage with challenging texts, improving literacy skills and building confidence. The thirty-five-member ensemble, representing ten CPS high schools, is in the midst of an intensive five-week rehearsal process supported by CST’s professional artists and technicians. Their hard work will culminate in a unique and personal presentation of A Midsummer Night’s Dream on CST’s Courtyard Theater stage November 7 and 8. 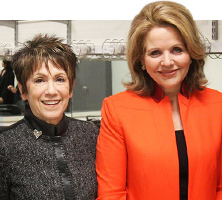 Earlier this week, Artistic Director Barbara Gaines joined renowned soprano Renée Fleming, cellist Yo-Yo Ma, Mayor Rahm Emanuel and other civic and cultural luminaries for the launch of “Be Creative,” Ingenunity’s initiative to support arts education in Chicago Public Schools. The event was held at Benito Juarez High School in Pilsen, a long-time partner of CST’s, and students from CST’s 2014 CPS Shakespeare! A Midsummer Night’s Dream ensemble performed as part of the event. Beginning November 19, the renowned theatrical innovators The Q Brothers are taking a break from their world-wide tour of Othello: The Remix to premiere A Q Brothers’ Christmas Carol—a hip-hop reinterpretation of Charles Dickens’ holiday classic. 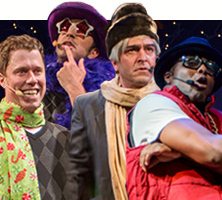 This marks the third collaboration between CST Creative Producer Rick Boynton and the Q Brothers, following two previous Shakespeare “ad-rap-tations.” Now in its third year of touring, Othello: The Remix recently played in Poland and, after the holidays, will continue on to Melbourne, New Zealand, Abu Dhabi and Dubai.